We're doing something a little different for Halloween this year. This time of year always brings out the monsters. And some of our favorites are the ones from literature. We're looking at retellings and reimaginings of horror classics like Dracula and Frankenstein. The Legend of Sleepy Hollow is a story that always reminds me of Halloween. Today I'm reviewing an update of that classic tale. 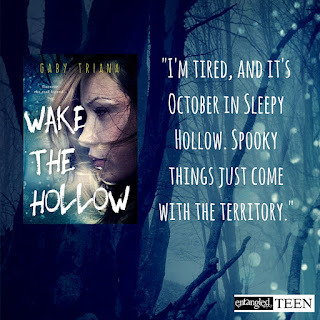 Wake the Hollow wound up being a perfect Halloween week read because it's set in October with leaves changing, cold weather setting in, and the town preparing for a Halloween festival. It's also perfect for our Classic Horror Week theme because in addition to Washington Irving, Mary Shelley comes up in Mica's research. I'm kind of glad I didn't read it in the summer when I first got it - I really enjoyed reading it in the same time it's set. I liked Micaela and watching her comes to terms with her psychic gift and her family legacy. I loved the local lore and urban legends that infuse Sleepy Hollow and I wonder how much of it is real. I found the actual "Legend of Sleepy Hollow" hard to read with its antiquated flowery prose but I'm tempted to read more about its author after the fascinating mysteries in this book. But something about the love interests in the story rubbed me the wrong way. With both of them (and with some other characters too) Mica goes back and forth on whether she should trust them and she doesn't always seem to have a reason for changing her mind. I wasn't convinced her feelings were genuine and had a few, "Wait! What?" kind of moments. And the guys were inconsistent in their behavior toward her as well. There were also some elements that could have been explained more clearly when the mystery wrapped up. Still I loved the atmosphere Gaby Triana created here. I liked the fact that there was a second layer of mystery involving Mica's parents, though again some of that could have been explained better. 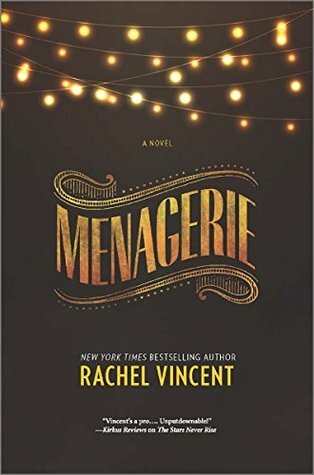 I think the book would make a great TV show - it has a very Riverdale vibe. Plus, you know, ghosts. Some of which might be headless. 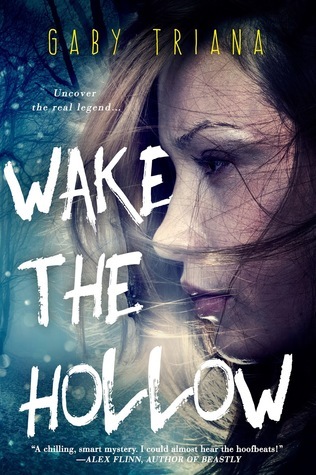 If anybody at the CW is reading my reviews, you need to adapt Wake the Hollow. We're doing something a little different for Halloween this year. This time of year always brings out the monsters. And some of our favorites are the ones from literature. We're looking at retellings and reimaginings of horror classics like Dracula and Frankenstein. We all have our annual Halloween traditions and I'm so excited to be reviewing a book that is one of my most longstanding traditions after watching The Nightmare Before Christmas. It's a clever monster mash combined with eldritch horrors and is a perfect read for the season! Plus, it acts like the perfect Halloween advent calendar! I ABSOLUTELY LOVE THIS BOOK! Seriously. I had never heard about it until I was reading some blog post or article of Neil Gaiman's where he was talking about how he would read a chapter of it a day during the month of October. Ever since that day almost ten years ago, my sister and I reread it together every Halloween. Our tradition has expanded to include friends, nephews, and godkids and while it is more often than not read over the phone or skype now it is still much loved by everyone. It’s just so quintessentially Halloween. This book is unique as it is told from the perspective of Snuff, the canine familiar of a knife-wielding man named Jack. The whole story is about an eldritch scavenger hunt between some of the most famous horror names in literature who are competing against each other. I'm not going to tell you what happens other than that because if you've ever read a Roger Zelazny book, you know half of the fun is trying to figure out what the heck is going on. Just imagine Sherlock Holmes, Count Dracula, Dr. Frankenstein, Rasputin, and several other well-known characters gathering in one place waiting and preparing for something big that's supposed to be happening on the night of Halloween. While the story has "human" characters in it, my godkids and nephews love that the whole book is about the animal familiars. Plus, since only a couple of those famous characters are actually named in the book, it kind of gives you your own scavenger hunt as you try to figure out which familiar belongs to who. It took me and my sister years to figure out who one character was. The tale is fairly lighthearted with quite a few jokes and puns, but when you stop to think about it, the plot is actually quite creepy. It's been proven time and time again that you can't help but fall in love with Snuff as you read. He's definitely the favorite among my family. If you're looking for a new Halloween tradition, I wholeheartedly recommend giving this book a try! We love it! Note: Although there are certainly a lot of literary references younger kids won't get, the book still has enough classic horror creatures that they'll be able to recognize instantly and the story is fun enough for them even without knowing who is who. It's my four year nephew's first year getting to participate and he has loved it despite only figuring out that one of the characters is Dracula! Today is going to be all about the book recs! Rose Red had so much fun coming up with this list! Some are delightfully creepy and others just have an atmosphere to them that just screams fall and Halloween. Most we've reviewed already and the ones we haven't have reviews coming next week. 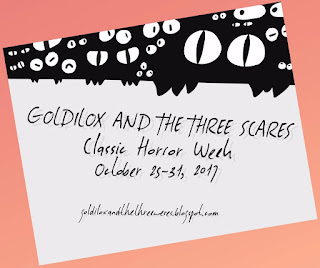 It wouldn't be a Goldilox and the Three Scares rec post without a giveaway! Scroll to the bottom to enter for a read that is guaranteed creepy for your All Hallows' Eve! 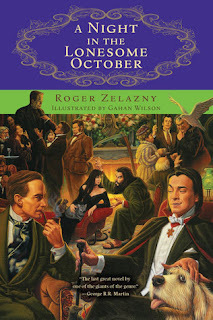 I have been rereading this book every October for years thanks to the recommendation of Neil Gaiman. It has 31 chapters so you can read one a night. 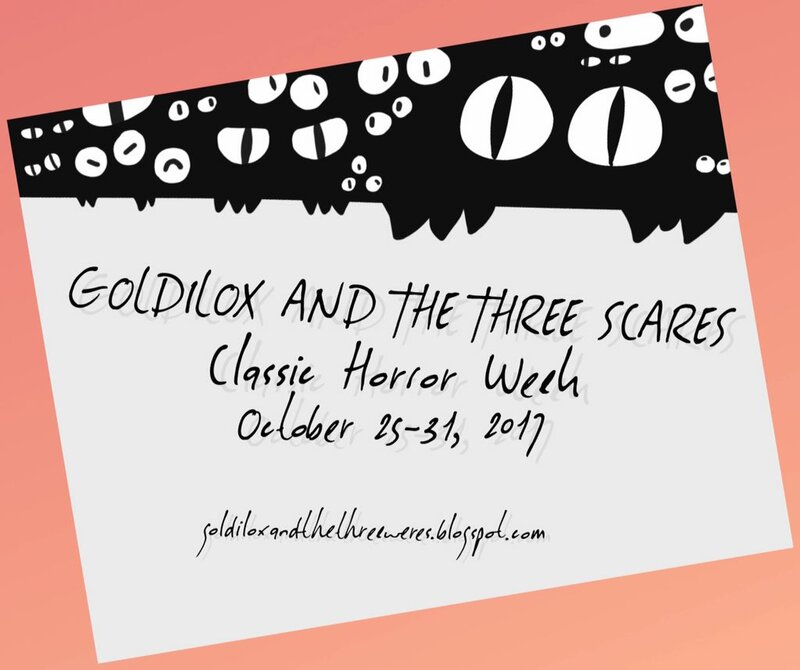 It's the story of an eldritch scavenger hunt between some of the most famous horror names in literature. It's told from the perspective of Snuff, the familiar of the man named Jack. It's fun trying to figure out which familiar belongs to which famous character. You can read more of my thoughts on it when my review goes live on Halloween. Alexandra Bracken's middle grade debut is the perfect read for the Halloween season. It gave me some serious old school Disney's Halloweentown vibes and you can't help but fall in love with the sassy demon, Alastor. 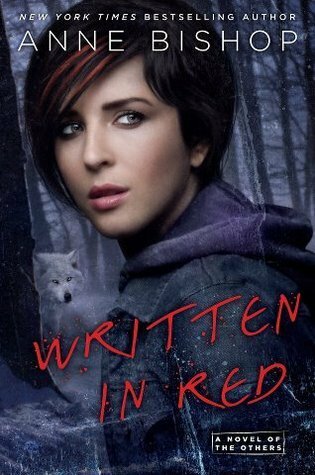 You can read Rose Red's review here. This book is one of my favorite Halloween reads of all time and is one I read every year. It's a retelling of the Jungle Book about a boy who grows up in graveyard among the ghosts and other creatures. The graphic novel is amazing too! You can read my thoughts on the book here. Have you ever needed a steampunk Frankenstein retelling in your life? If the answer is yes, then this is the book for you. I loved everything about it including the fact that Mary Shelley became a character and not just reference. You can check out my review here for more of my thoughts on it. This series has been some of the best YA historical fiction I've read in forever. Audrey Rose and Thomas investigate Jack the Ripper all over White Chapel and go to a forensic school in a creepy old castle that is said to have been the home of Dracula. Just everything about the settings of these two books make these perfect Halloween reads! My reviews for both books can be found here and here. The Raven Cycle has ghosts, psychics, street racing, and a hunt for a dead Welsh king which gives it a whimsical and eerie feel. That feeling plus Stiefvater's writing style makes it a perfect read for the Fall especially around Halloween. This quartet quickly catapulted itself onto my top five series of all-time list. You can read more about how much I loved it in this RTFB here. What are your favorite Halloween reads? 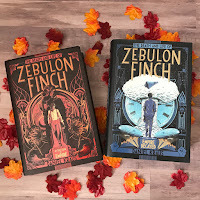 We're giving away hardcover copies of both Zebulon Finch books! They're super pretty in real life! We're doing something a little different for Halloween this year. This time of year always brings out the monsters. And some of our favorites are the ones from literature. We're looking at retellings and reimaginings of horror classics like Dracula and Frankenstein. And I'm so excited to be reviewing our Frankenstein retelling today! I have loved Mary Shelley's Frankenstein since I first read it in high school but I didn't know that I needed a steampunk retelling of it in my life! I absolutely adored This Monstrous Thing! I'm still floored that this was Mackenzi Lee's debut novel because it was almost perfect! It's the story of a young man named Alasdair living in an alternate 19th century full of cogs and steam who is driven by love and pride to use his highly illegal talents to resurrect his brother, Oliver, after a terrible accident claims his life. Lee’s version of Geneva in 1818 is a steampunk world filled with secrets and clockwork people. These Victorian cyborgs are maintained by illegal mechanics called Shadow Boys like Alasdair and his family. I loved the world Lee introduced us to in this novel. It just felt so authentic and the steampunk blended seamlessly with the other elements of the story to create a unique, fascinating world. The author chose to set this book in the 1800’s around the time Frankenstein was published and I think it was a wonderful decision. 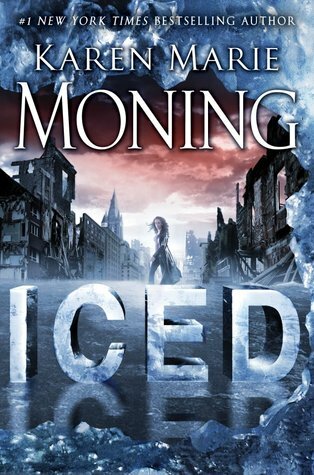 Not only does this book explore the themes of the source material it's based on, it explores the world in which that novel exists and poses a major threat to Alasdair and those he loves because that book appears to chronicle his attempt at bringing Oliver back from the dead. I can only applaud Lee's decision to make Mary Shelley a character in this book and who also happens to be Alasdair's ex! Oh, the meta gothic is strong with this one! I loved how this book didn't simply retell the plot of the original with a few slight twists and turns but integrated the publication of the book as a plot point! When Frankenstein is released and people start reacting to it, Alasdair is forced to make some big decisions about his brother and his own future as well as his family’s reputation. This gives the book an air of suspense, and makes you worry for Alasdair and his family’s safety. We see his struggle of choosing between his reanimated brother and the future he’s always dreamed of and what those choices mean for him and everyone he loves. There’s hardly ever a dull moment as Alasdair discovers the secrets of his ability and works to figure out what the right decision to make is. I have only one complaint and it's that while the central relationship between Alasdair and his brother Oliver is deliciously complicated and nuanced, the story's big reveal was fairly obvious from page one for me. But I'm willing to forgive that because Lee's world was so beautifully built and so lovingly rendered and I was hooked from the first. This Monstrous Thing is the perfect gateway drug to Shelley's original novel, which was probably not Mackenzi Lee's primary goal, but is still a happy side-effect of her gorgeously written creation. It makes for a perfect Halloween read! We're doing something a little different for Halloween this year. This time of year always brings out the monsters. And some of our favorites are the ones from literature. We're looking at retellings and reimaginings of horror classics like Dracula and Frankenstein. And we're starting off with some that we've already reviewed. Watch for more reviews of books inspired by Classic Horror this week, along with some Halloween book recs. It wouldn't be an event without a giveaway, so we've got a couple of those for you. The first one's right here at the bottom of the page. Check out our Instagram for another classic horror-themed prize. Probably the most popular of the Classic Horror novels is Bram Stoker's Dracula. We loved Kerri Maniscalco's take on it. Not only does Carr include the daughter of the original Dr. Jeckyl (And she's a Steampunk CSI! How awesome is that?) but other classic characters like Dr. Frankenstein appear in the series as well. While they're not generally considered horror since they were written for children, I would argue that the surrealist elements in books like The Wizard of Oz and Alice in Wonderland can be horrific. They come from the same Gothic roots as the horror classics and certainly lend themselves to frightening retellings. Christina's Henry's very adult take on Alice is a great example. Need a great Halloween read? 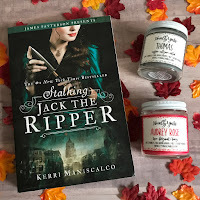 We're giving away a copy of Stalking Jack the Ripper by Kerri Maniscalco and a pair of SJTR-inspired candles from Novelly Yours. Sebastian Montcalm knows freedom for the first time in his life, but it has come at the cost of his father's soul. If he can learn to harness his uncontrollable sorcery then he might be able to save his father from a demon's grip, but every move he makes leads to failure. The only thing that gives him hope is the innocent touch of Cleo Sinclair, the woman he was forced to marry. But will his darkness drown out her light? Cleo knew her father only ever loved her for the power of her visions, but when he bartered her away in marriage to a man she'd never met, she realized how little value she truly had. Her husband, Sebastian, was nothing more than a dark warmth in her bed, a stranger who refused to touch her. But together, the two tortured souls found friendship. And now, when he needs her the most, he won't even look at her. 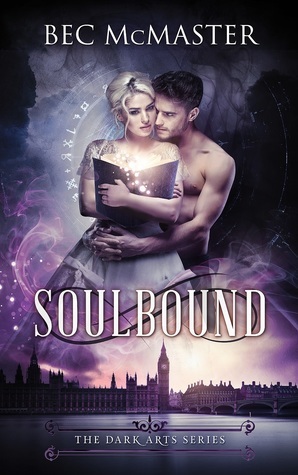 Soulbound is an unusual romance in part because Sebastian and Cleo have been married already for most of the series. But they've also been big parts of both of his older brothers' books - I think they are the only ones whose POVs are in every book of the trilogy. The story is about Sebastian finding a home with his brothers as much as finding love with Cleo. I think that makes the readers much more invested in their HEA than we might normally be. And I think the book provides a satisfying conclusion to their slow burn romance. I was surprised how much new information McMaster brought in to their story, making the finale so much more than just the final showdown with the Big Bad. Cleo, in particular, turned out to be much more complex than I (or she) was expecting. Soulbound even introduced several new characters, at least one of whom I think will be featured in the spinoff series. Yes, I said spinoff! The Dark Arts world is one that grew on me so I'm excited not to be leaving it behind for good. I've really enjoyed this world of sorcerers and demons. It's set in a similar time and place to McMaster's London Steampunk series, but feels very different. And the trilogy is now complete so fellow binge readers, now's a good time to start if you haven't yet. Not only is it non-horror, it's non-fiction. 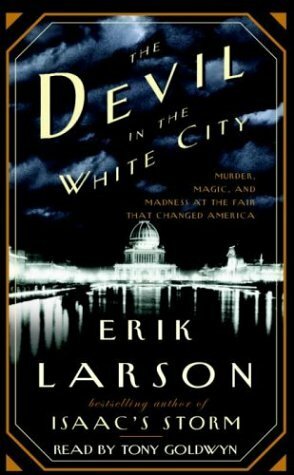 This book juxtaposes the story of the Chicago World's Fair with the life of the nation's first serial killer, H.H. Holmes, who hunted his victims there. Harry Potter isn't part of the horror genre but it has some really creepy and scary parts. One of the parts the creeped us the heck out was the whole resurrection scene in Goblet of Fire. Voldemort is always evil and creepy but using the blood of his enemies and bones of ancestors to resurrect himself is just... *shudders*. I'm not sure that Schwab meant to scare us with the Dane twins and their White London but she succeeded. The Danes keep the bones of their enemies under their feet and have a garden of statues of those who have slighted them. Their keep is extremely creepy and is a place we never want to see the inside of. The cryptids imprisoned in the menagerie aren't the monsters in this story, their captors are. Man's inhumanity toward those who are a little different is both frightening and frighteningly real. Except for a few of the Wolfgard who are kind of like fluffy puppies, the Others are scary. The vampires are creepy, the Harvesters are frightening, and the Ancients are terrifying. But this is such a unique and fascinating world and one of our favorite series. What non-horror books have scared you?